Lake Towada (十和田湖) is a beautiful lake located on the border between Akita and Aomori. It is the 12th largest lake in Japan. 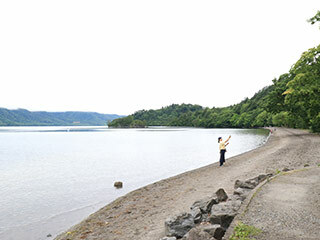 Lake Towada was formed by the eruption of Mt. Towada. So, it is a crater lake and deepest point is about 326m below the surface. The altitude of this lake is about 400m above the sea level. This lake is surrounded by the beautiful nature and there is a breathtaking valley. It has rich wild animals and birds as well. 1. use the local bus to Yasumiya Stop. Lake Towada is the 12th largest lake in Japan. It is located between Akita Prefecture and Aomori Prefecture. Because of the beautiful scenery, it is chosen as the special national scenic beauty and the natural monument of Japan. It is a crater lake and its altitude is 400m above the sea level. The deepest point is 326m. It is still categorized as the active volcano. There are many tourist attractions such as boat ridings, cruisings and many Onsen and camp sites. It has a beautiful Koyo in Autumn and green leaves in early Summer time. Oirase Valley is one of the most beautiful nature spots located in Aomori Prefecture. It is the 14km long small valley with a riverside walk that you can enjoy great hiking nearby pure walk. There are many great waterfalls running into the river. This site is chosen as national special scenic beauty and a natural monument. At the early summer, you can enjoy beautiful green leaves, and in Autumn, all the leaves have breathtaking Koyo.